Hello Hello Hello! 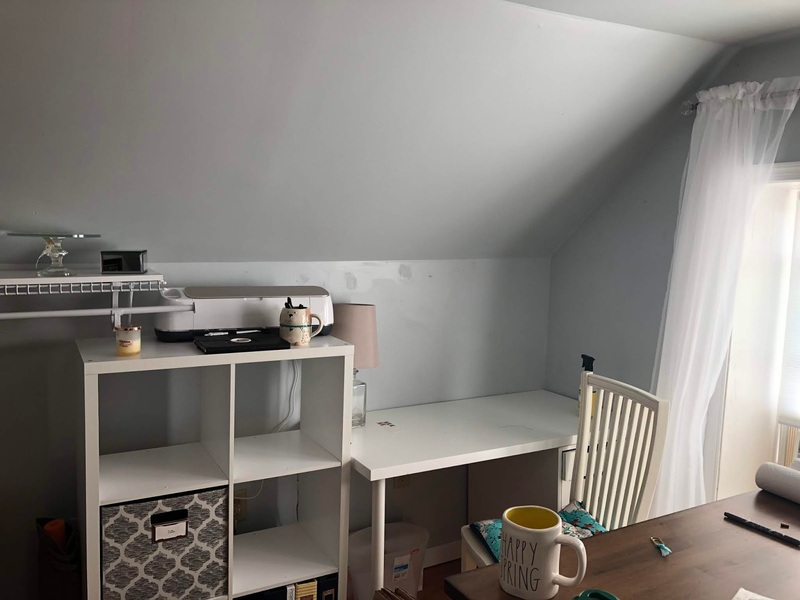 Craft Room/Office redo? I know it’s been ages and I’m so sorry to be gone for so long. Life just got really busy and I haven’t been motivated to craft at all. I’ve done a project here and there but nothing super-exciting. I’ve decided I just really need to purge and reorganize and get my craft space the way I want it. I have all these DIY ideas I want to try out and share, but my space is just a mess. It got really bad over the winter months and honestly I haven’t really been in my room except for a few projects I did for friends. Maybe a redo of the space will get me motivated again. Do you want to follow the journey of redoing my space with me? 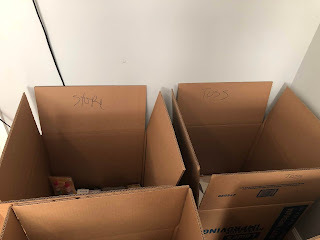 I can't promise I will video record the whole thing as most times it is just picking things up and sorting, which isn't super entertaining, but I do promise to post updates here on my blog. I'll do a video or two when I get to more exciting things. I’ve started to sort out and even move out some pieces of furniture. I will tell you, as much as I love the Target version of the Kalax units. I’m not a big fan of how they hold supplies. Sometimes you just need small drawers to make separating and storage more easy to access. The big 13" cubes sometimes are too much. Here are a few photos of what I’ve done so far. I cleaned off my desk and emptied the drawers as well as emptied out a cubby section that had some sewing supplies along with vinyl and scrapbooks. This sections I haven't touched yet, but was hoping you all had some inspiration for this area. I think I over crowded it with too much furniture around my bookcase. 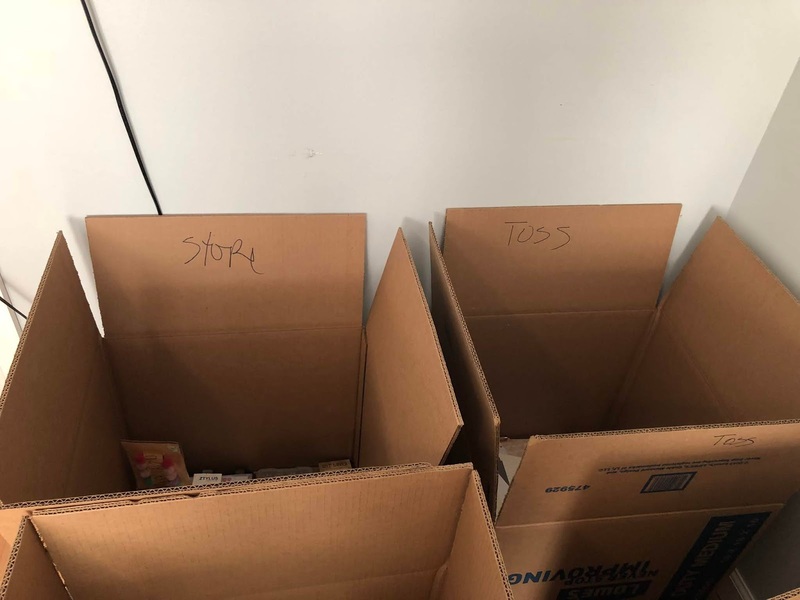 Scott went and got me a ton a boxes to help sort out what I’m going to keep in my room and what I’m going to store in the storage area. This corner had my Kallax unit...it's now empty and being used as a staging area for sorting. That's all I have for right now. I hope you enjoy my journey as I get back into crafting and sharing again. Love to all and a huge thank you for checking in to see how I was doing. Welcome back! I’m excited to see the transformation as I am going to do the same. I’m not even sure where to start because I have so much STUFF. I really need to purge my supplies as well, but find it hard to do. Good luck. Welcome back. I am in the middle of purging too. I agree with you that those big cubes don't work for keeping smaller items organized. Anxious to see how it all turns out. Like you, I came to the realization long ago that a "cute" craftroom was not my style... too much "wasted" space. My craftroom (which I love) is wall-to-wall, floor-to-ceiling, 5-shelf utility units (around the perimeter 2.5 walls); each shelf holds 10 clear Iris 12x12 labelled storage boxes with a small space in the middle. I waited until the boxes were on major sale at J's or M's. 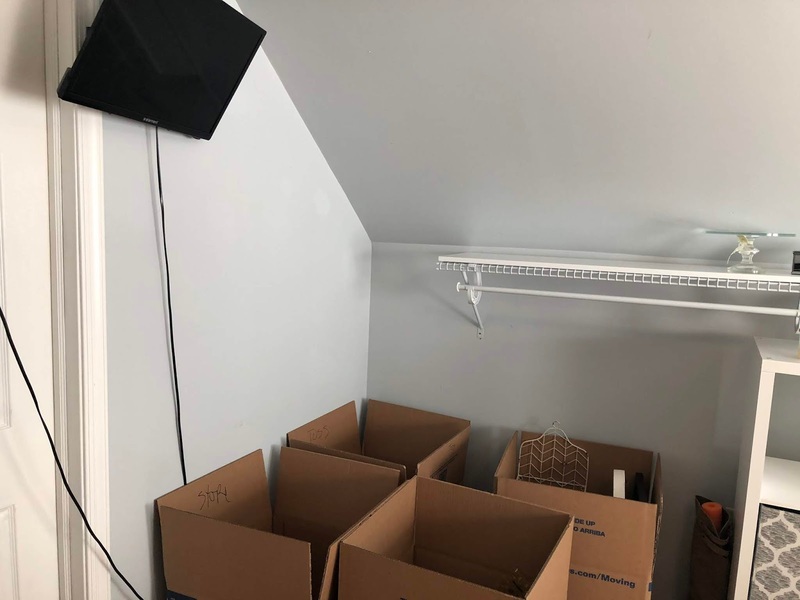 The 4th wall (and the closet interior with doors removed) is in a constant state of flux, but essentially electronics are on this wall along with various-sized storage drawers and cubes. I do have a ScrapBox, and a folding quilt-making table jutting out into the middle of the room, creating an island work-table when the leaves are extended. My room won't win a House Beautiful award, but it's cozy and comfortable and totally works for me. I'm interested in seeing your "transformation". Have fun. WOW that sounds like an awesome space. I've seen the ScrapBox units and they are amazing. Hi Christina, Welcome Back!!! There comes a time in which I believe all of us crafters need a break, especially when life takes over. Cant wait to watch your updates. Yay! your coming back, I was wondering where did Christina go?. So excited you are coming back I have missed your blog, your videos. Sometime in life you just need to take a break from everything and then you mojo comes back better then ever. Welcome back Christina!!! Thanks Roxanna. I've missed it. So nice to hear from you, Christina! I was just wondering about you the other day, so i was glad to get the email about your latest post. Life happens, and crafting has to take a back seat sometimes. I will look forward to seeing you transform your space into something that works better for you! Hi BethAnn, hope you are well. I missed all of you guys and really excited to get back to creating again. Welcome back! You were missed! I never purchased the Kallax unit. Not my style and the cubes are so confining. I love the Algot system also from Ikea. So many variations you can make out of that system and it can be made to fit any space. I combined that with drawers which I love, too. Can't wait to see how it all turns out. I've never heard of that system. I will have to see what they look like :) Thanks for sharing. Welcome back!!! I've been missing your videos! We've missed you! 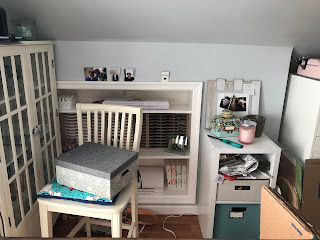 I have been moving things around in my craft room also and I came to the conclusion that I have too much and am a little overwhelmed with it all. So am getting ready to box a lot of it and give away or sell. Maybe then, I will know exactly what I have and then proceed with creating!! It's not easy to purge. I did a major purge a few years ago and I have items I regret getting rid of. This time, I'm putting them in storage for a bit to see if I go back for them. That's my best advice. Wait a bit before you make the decision to get rid of anything. It's worse when you have to buy that item again. I too am in the process of purging and moving my craftroom. Right now I’m in a bedroom 10x12 give or take an inch or so and will be moving down to the basement to a 8x15 space not much more room just different configuration and more storage and light. So purging is way important right now. The new space is cleared and ready for framing and Sheetrock. We hope to have it finished by September-Labor day. 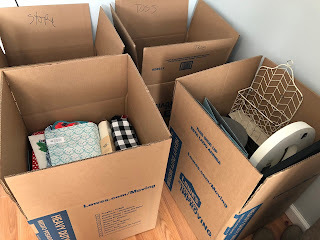 I’m into a lot of different crafts (scrapbooking, cross stitching, coloring, painting ceramics and hobbies like making puzzles) so I need plenty of storage for all my goods. I can’t wait to see your transformation to your room and maybe get some ideas as well. Keep the pictures and videos coming. That is so exciting. It's a lot of work when you have to frame out and sheetrock. We did that almost 3 years ago in the space I'm in now. It can get messy and frustrating, but both of us are lucky as it's not in our actual living spaces. The dust from sanding the sheetrock is the worst. So surprised and delighted to see the email you are back! You have been missed. Can't wait to see what you do with your craft space. I'm always happy when I just clear off my working table.